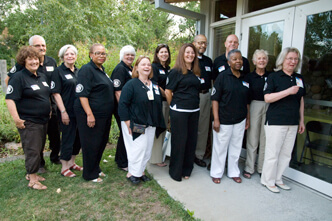 BLCiH Americorps Encore Members serve as patient navigators, community health workers and volunteer coordinator assistants throughout the community Launched in 2010, Boomers Leading Change in Health (BLCiH) is a groundbreaking, grassroots volunteer effort dedicated to improving the health – and access to health care – of individuals and families in the Greater Denver community by harnessing the experience, energy and conviction of adult volunteers over age 50. BLCiH matches volunteers with 11 partner agencies, helping more than 26,000 individuals and families access health care benefits and services or navigate the health care system. Boomers Leading Change in Health is part of a national movement, the Community Experience Partnership, to provide adults 50+ with meaningful volunteer opportunities that will empower them to affect significant social change. Rose Community Foundation supports BLCiH through a joint grantmaking effort between our Committee on Aging and Health Committee, and BLCiH is the current focal point of our Boomers Leading Change Initiative to mobilize adults 50+ as a key community resource. Learn more about how to get involved with Boomers Leading Change in Health including volunteer opportunities, events and subscribe to The Boom Box e-newsletter.